Orica-GreenEDGE head into the Giro’s second day with the leader’s maglia rosa amongst their ranks in a repeat of last year’s opening week; Simon Gerrans having the honour this time. 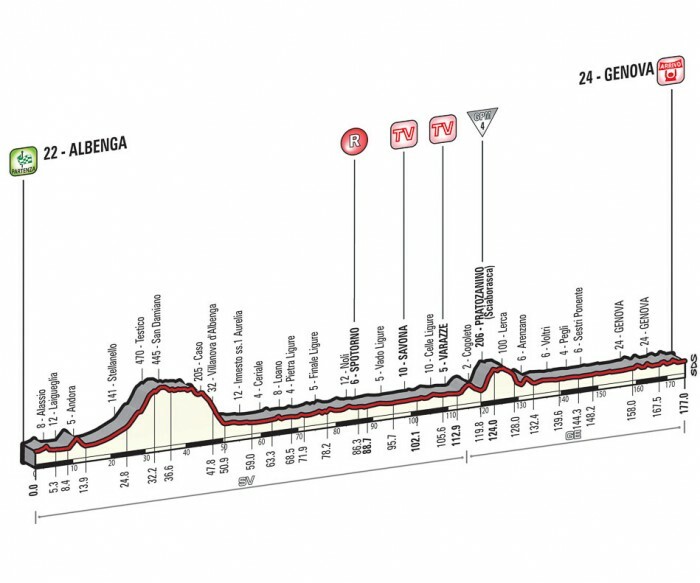 Day two consists of a simple enough trip along the coastline from Albenga to Genova, immediately rewarding those sprinters tough enough to attend this especially gruelling edition of the Giro d’Italia. It is a 177km route which traces the Ligurian coast from their departure in Albenga, opening with a lumpy 50km of riding; this includes the climb of Testico after a little over 30km. The sole categorised climb of the day comes with 53km remaining, Pratozanino is 4.2km long and includes a maximum ramp of 10% during its average of 4.9%. It is unlikely we will see any of the sprint favourites slip out the back here, but the subsequent terrain and distance is favourable enough should a rider find themselves having to chase back on. Comprising the day’s finale are two city centre laps of 9.5km, which along the way include inclines of 4% and false flats before the peloton make the final turn onto the wide finishing straight. Most qualified in the sprints for Orica-GreenEDGE is Michael Matthews, a man who has really begun to tap the talent which many saw present in him for some time now. Despite a year where he has often taken the win despite the presence of rivals blessed with greater raw speed, this stage seems a step too far with its flat finish and a course unlikely to drain the legs enough to level the playing field for him. Regardless, he should find himself in pink by the end of the day after his team’s successful time trial and will no doubt be the best placed sprinter on general classification. A couple of seasons ago Lotto-Soudal’s André Greipel would have been the clear cut favourite for this stage, but his form as of late has been a mixed bag at best. The nature of the finale suits him particularly well, ensuring the winner will need a good mixture of strength and speed to take the win in Genoa. The standout negative for the German is the lack support in order to both control the race and lead him out in the finish. He is not on his own in this respect as many sprinters have arrived here with greatly diminished leadout trains which would usually ensure a safe passage to the line. This fact will make the sprints at the Giro d’Italia more chaotic than those we are used to seeing at Le Tour de France; something Greipel does not always cope well with. Sacha Modolo could be the dark horse able to cause somewhat of an upset, possessing what is seen to be a reliable combination in lieutenants Roberto Ferrari and Maximiliano Richeze. The opening sprint stage is bound to be a nervous and messy affair, an environment which Modolo is known to benefit from and will see the false flat as another advantage for him. This perhaps is not his most ideal stage during the grand tour, but remains extremely winnable for the wily Italian sprinter. Home support will be eager to see Elia Viviani take his first Giro d’Italia stage win here and he certainly has the potential to do so given his impressive top end speed. The season so far for the Italian has not been ideal beyond his curtain raiser in Dubai (one win and two podiums) and suffered a couple of nasty crashes during his spring classics campaign. He is short on support like many star sprinters here and has mixed form in chaotic conclusions much like Greipel, but if he finds clear daylight to sprint towards he will be a clear favourite. Rounding out the top tier of Italian sprinters at the Giro d’Italia this year is Trek Factory Racing’s Giacomo Nizzolo. He only has one win under his belt so far this year and has also never managed to convert a raft of podium places at his home grand tour into a stage win up to now. However, unlike most this year, Nizzolo has a reasonable amount of riders in order to support him during his tilt at the sprint stages. His attributes are a blend of many of the skills already mentioned previously; positioning, acceleration and a penchant for drags up to the finish. He is incredibly consistent at this race, but whether or not he finally breaks his Giro duck on stage 2 is difficult to say for certain. Moreno Hofland will be making only his second grand tour appearance, but should be apparent in the day’s final mix up. His showings at Tour of Britain, Paris-Nice and recent win at Tour de Yorkshire indicate he is more than capable to compete alongside the big name sprinters at these major events and cannot be discounted from the podium. The conclusion to day two will certainly make for fascinating viewing given the innate anxiety present during the opening stages of any grand tour. With many teams lacking a coherent leadout train, the sprint itself is likely to be a chaotic affair, where those blessed more with positional nous than pure speed could benefit most. Posted on May 10, 2015 by Spokenforks	This entry was posted in Giro d'Italia 2015, News and tagged 2015, Albenga, André Griepel, Elia Viviani, Genoa, Genova, Giacomo Nizzolo, Giro d'Italia, Lampre-Merida, Lotto-Soudal, Michael Matthews, Moreno Hofland, Orica-Greenedge, Preview, Sacha Modolo, Spokenforks, Stage 2, Team LottoNL-Jumbo, Team Sky, Trek Factory Racing. Bookmark the permalink.